BIRTHDAYVERSARY CONTEST!!! You, too could win free stuff! So! As you guys are aware, it’s our first successful year of posting comics every week for your enjoyment. It’s been a wild ride. We’ve met some cool characters. We’ve seen color pages and slowly but surely we’re uncovering Kazuo’s past and discovering why he’s traveling with his little bunny. To thank you for your support, and to celebrate our 1st Birthdayversary we wanted to hold a little contest. Step 2: Every Wednesday we post to Facebook and Twitter that we’ve updated the comic. Step 3A: You Share the status on Facebook with all of your friends! Step 3b: You Retweet the post to all your Twitter followers using the #Birthdayversary hashtag so we can keep track! 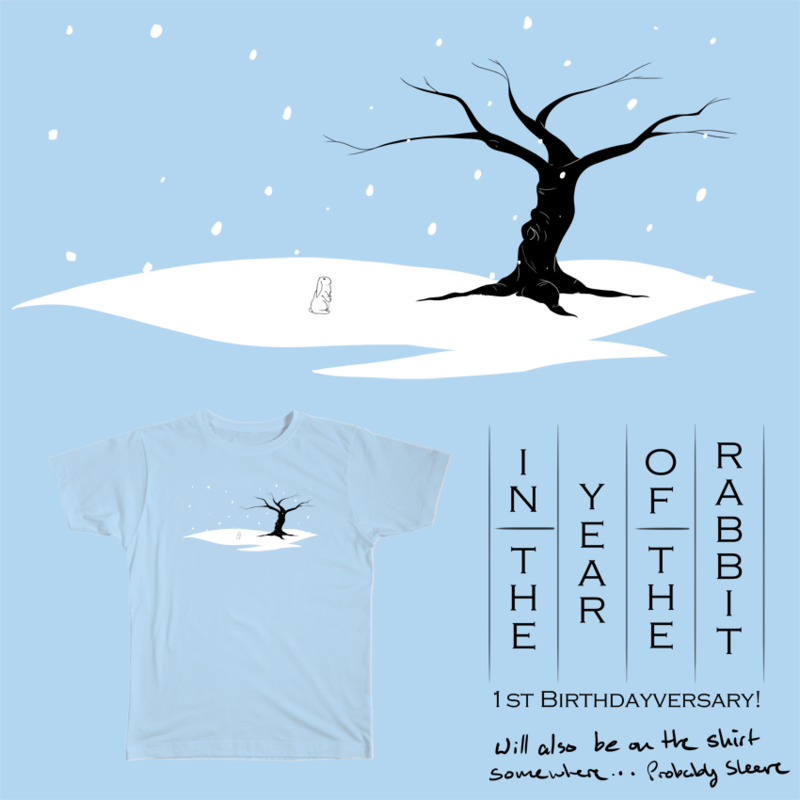 Step 4: On January 31st we’ll pick the winners at random (names from a hat style) and contact them for their addresses and shirt sizes for one of 5 limited edition In the Year of the Rabbit shirts! These shirts are going to be lovingly hand-crafted by a dear friend of the comic and professional screen printer and will be printed on light blue shirts. Ideally once we hear back from everyone I hope to have them shipped out by the end of February at the super latest. Once they’re shipped out we’ll contact the winners once more to give them tracking information. While we’d love you to repeatedly Share and Retweet our comic to all your friends, you’re only going to get one entry per social media site per week. We’re doing this to keep it fair and because we want to see how many people actually read all the rules. That’s still two potential entries per week though! We understand and greatly appreciate that we have a lot of readers, Twitter followers and Facebook friends from different countries. If you’re one of them and you’re selected for a shirt we’re going to do our best to make sure you get it. But please remember that we’re still a Pop & Pop establishment, all these costs are coming out of our own pockets and a $15 shirt might not be worth the cost of $80 shipping. If it looks like someone won by gaming the system we reserve the right to pick a new winner and be deeply, deeply disappointed in you. We’re really happy to bring you guys this little contest, and I hope you guys like the shirt. Ideally we’ll start releasing some more merchandise this year, if it seems like a thing people want, otherwise I’ll probably design another shirt for next year!